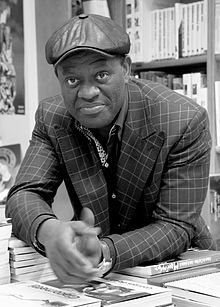 Born in Africa’s Congo in 1966, poet and novelist Alain Mabanckou lives in Southern California, where he teaches literature at University of California at Los Angeles (UCLA). 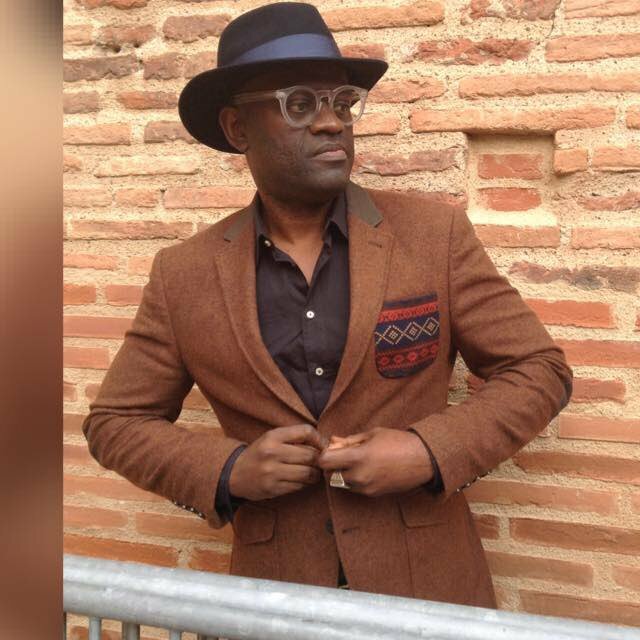 Mabanckou is the author of six volumes of poetry and six novels, winner of the Grand Prix de la Littérature 2012, and recipient of the Subsaharan African Literature Prize and the Prix Renaudot. His books include African Psycho, Broken Glass, Memoirs of a Porcupine and Black Bazaar. 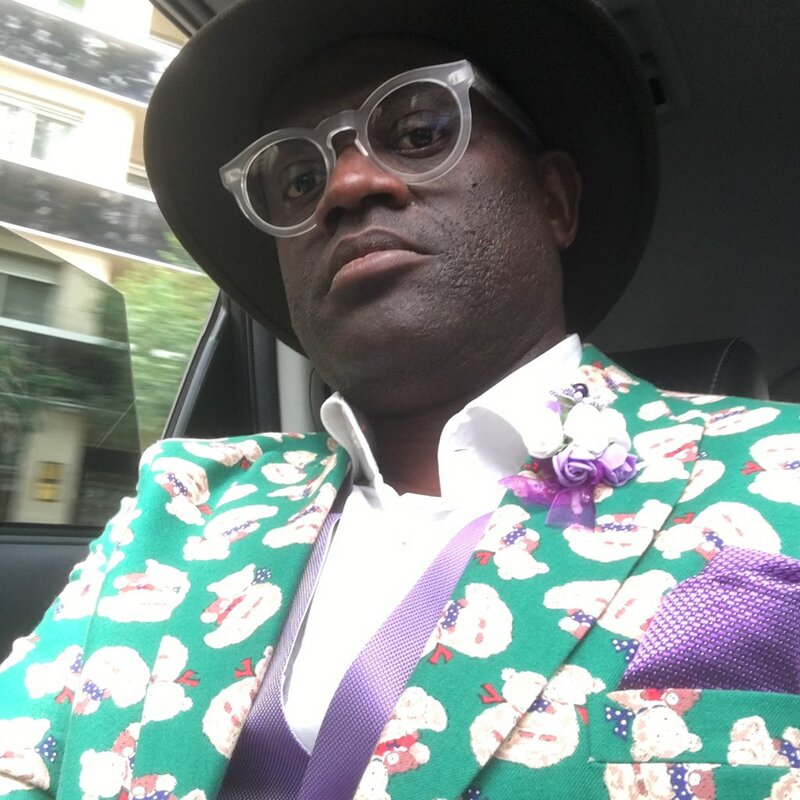 Earlier this year, when I had the opportunity to meet and interview Mr. Mabanckou in Santa Monica, California, I found that his absurdist humor and flamboyance covers an inner strength, commitment and fortitude. After all, I had become aware of this writer when he chose to present the PEN American Center’s Toni and James C. Goodale Freedom of Expression Courage award to the satirical weekly publication Charlie Hebdo in spring 2015, mere months after Islamic terrorists slaughtered the publication’s staff in Paris after Charlie Hebdo printed a cartoon of the Moslem prophet Mohammed. Alain Mabanckou bestowed the award to Charlie Hebdo‘s editor-in-chief Gerard Biard to a standing ovation from writers, journalists and publishers 48 hours after Islamic terrorists assaulted a Texas cartoon competition for depicting the prophet Mohammed. The gala was held as police officers guarded the venue, New York City’s American Museum of Natural History. Mr. Mabanckou spoke in a French accent with enthusiasm and vitality. This is an edited transcript of the interview. Scott Holleran: How do you pronounce your last name? Scott Holleran: Do you live here in Southern California and also in Congo, Africa, and Paris? Alain Mabanckou: Yes. I teach at UCLA and live here. I also kept my parents’ home in Congo. In Paris, I decided to buy something because I felt that having a home in Paris is secure compared to the United States. The market will not go down. In France, it still remains like that, you know? So I bought [my home in Paris] in 2006 when I had [bestselling author] success. Scott Holleran: Do you consider yourself primarily French or Parisian, African or Congolese or American? Alain Mabanckou: I think I remain Congolese. I remain a Congolese who is open to other cultures. In my deep conviction, I remain a Congolese who was raised in French culture. I like to dig my own roots to explain to myself what being Congolese [means]. This is very important. I think literature is about expressing a detail which is in your culture to other people that they’ll understand. Scott Holleran: Who are other influences? Alain Mabanckou: French literature is obvious. After French literature, I read Latin American literature. So, [Gabriel Garcia] Marquez, Horatio Quiroga, Mario Vargas Llosa, Octavio Paz. I like literature, you know? I like reading, first of all, the classics. So, for American literature, besides Hemingway, I read [William] Faulkner’s The Sound and the Fury, Absalom, Absalom! And it’s curious, but when I was reading Faulkner—I was like 20 or 23—I didn’t know that he was white. The first time I knew that Faulkner was white it was when I went to the University of Michigan. I was passing or crossing a road by a bookstore and there was a kind of commotion about Faulkner’s books. That was the first time I saw a photo [of Faulkner]. I said to my friend, “Faulkner is white?” Because, you know, his work was talking to me. It was like, this kind of desperation, this kind of broken world—it was like mine. So [when I learned that Faulkner is white] I was like, “Wow!” That was a big surprise for me. That was great. Scott Holleran: Because it showed the power of writing? Scott Holleran: Your mother had been training you and teaching you to be well read, right? Scott Holleran: Did you read them in French? Scott Holleran: Your books are translated into 15 languages. Which are available in English? Alain Mabanckou: African Psycho, Broken Glass, Memoirs of a Porcupine, Black Bazaar, Letter to Jimmy, Tomorrow I Will be Twenty. Scott Holleran: Which book should the American reader start with as an introduction to your work? Alain Mabanckou: Readers often say Broken Glass. As for me, I think that it should be Tomorrow I Will be Twenty because the protagonist or narrator is ten and he’s trying to describe Congolese history but at the same time the history of the world. You’re going to see the war in Vietnam and Henry Kissinger, and it’s like how, when you are a kid, you receive the sound and the fury of the world. How are you going to deal with that? So I think this book is the one to read if they want to get inside my world because you’re going to see my mother there, you’re going to see when I’m a kid, you’re going to see a small teenager trying to get in love, you’re going to see French people, dictatorship, everything is in it. Maybe it’s the longest book I’ve written, close to 400 pages. Scott Holleran: Are you working on something new? 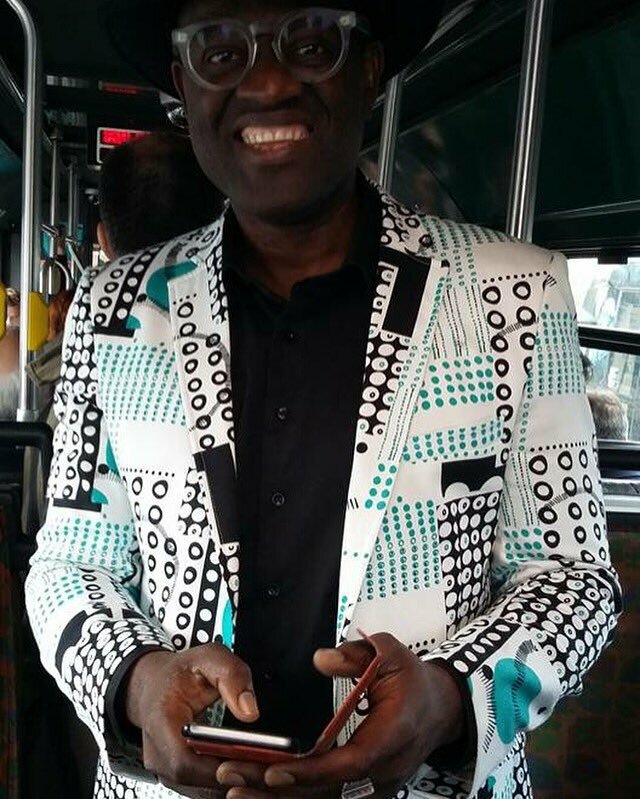 Alain Mabanckou: For the time being, I’m working for the classes I’m going to teach at the College de France starting this year. I’m also going to publish a nonfiction book about African literature. So, I’m trying to introduce the student to African literature. Scott Holleran: Why did you decide to present the Freedom of Expression Courage award to Charlie Hebdo? Alain Mabanckou: Beside the fact that I am a Charlie Hebdo reader, as a writer, I thought it was the moment to step up and say: “No. We cannot let people reduce the freedom of speech. We need to explain to the world that if we are writers, it’s because people struggled for us to become free. So, we cannot take [freedom of speech] for granted, sitting in an armchair and just watching TV and saying, ‘Oh, go ahead.’” If you are a writer, and if you understand that the freedom of speech is being erased, you have to speak out. So, I had to go to New York [to present the Freedom of Expression award to Charlie Hebdo]. I know I took a risk because my face can be seen by the Islamists, by people in France, but I said to myself, “What does it mean for me if I cannot [redeem] what literature gave to me—that freedom?” So, that’s why I stepped up. It was one of the emotional moments of my life. There were like 800 people—a lot of entertainers like Glenn Close and Steve Martin—who came as a show of support. Scott Holleran: Did anyone try to talk you out of going? Scott Holleran: Was it easy to write a speech? Alain Mabanckou: I wrote it in French, as I often do when I have to read a speech in English. I write first in French and give it to one of my graduate students to translate. So, I think that it was a great moment—my certificate of birth as a writer in the United States. Scott Holleran: I know that Joyce Carol Oates and other writers came out and angrily denounced Charlie Hebdo’s artists and writers, insinuating or claiming that they instigated the Islamic terrorist attack. What do you think of that viewpoint? Alain Mabanckou: No! At the same time, I can [almost] understand because none of them had read a single issue of Charlie Hebdo. They were just talking about what had been shown, a kind of caricature of Mohammed. If you haven’t read Charlie Hebdo, you cannot judge. They were trying to say that you can’t criticize Islam. But, at the same time, you can criticize Jesus Christ, you can criticize Buddha. So there are those who know Charlie Hebdo and those who don’t know. Scott Holleran: Or those who know what freedom of speech means and those who don’t? Alain Mabanckou: Yes! So, that was it. I think that it’s pitiful to see that sometimes people judge without having proof. Scott Holleran: Would you do it again? Alain Mabanckou: Yes, definitely. I would do it again. Scott Holleran: Did you get support from other writers, including people in the room? Alain Mabanckou: Yes. I received encouragement from writers and journalists. It’s also helped me also to get to know people. I even changed publishers. Scott Holleran: Do you remember where you were when the Charlie Hebdo office was attacked? Alain Mabanckou: I was in the United States. I knew one of the journalists killed. He was a friend of mine. Scott Holleran: What was his name? Alain Mabanckou: Bernard Maris. I took it personally. Scott Holleran: Do you remember where you were when Islamic terrorists attacked the Bataclan nightclub in Paris [in November 2015]? Scott Holleran: How did you hear about it? Alain Mabanckou: I was watching soccer with the Paris Saint-Germain. And all of a sudden on TV, I heard like a shot: boom! which was a kind of bomb they put outside the stadium. But I was watching TV, so the sound came from the TV. Then, they said that the Stade de France was under attack and everybody went to the Stade de France. But it was [also] happening somewhere else at the [avenue de la] République, which is close to my house. Scott Holleran: What did you do? Scott Holleran: Did you start getting e-mails, texts and phone calls from friends? Alain Mabanckou: Yes, e-mail. The press wanted me to write about freedom, so I wrote a piece for Vanity Fair, the French edition, and I wrote for … I think it was Liberation. Two or three newspapers. Scott Holleran: So you wrote during the attack? Scott Holleran: You talked about taking a risk. Have you been threatened? Alain Mabanckou: [Pause] Fortunately, no. But the danger would have come from France. As I’m living in the United States, it’s okay, you know? Charlie Hebdo is a tough issue in France. Scott Holleran: You’ve mentioned Victor Hugo. Did you study his novels? Alain Mabanckou: Yeah. It was mandatory at school [in Congo]. We had to read French literature—Balzac, Proust—and we read each writer closely. I was influenced by Hugo and the romanticists for the poetry. I liked Lamartine, Victor Hugo, Baudelaire, Verlaine. I like Les Misérables, which is becoming like a comedy here [in the United States], Ninety-Three, Les Travailleurs de la Mer—I do not know the title in English [The Toilers of the Sea]—L’Homme Qui Rit, The Man Who Laughs. Hugo is the major writer. You cannot avoid Victor Hugo. If you go to poetry, he is there. If you go to the novel, he is there. If you go to the play, he is there. Scott Holleran: Strictly speaking, you’re not a romanticist, so how do you classify your genre? I know some have said absurdism. How do you regard what you write? Alain Mabanckou: Yes, the observer.